NASA's Curiosity Mars Science Laboratory as seen on Aug. 12, 2011 at the Kennedy Space Center in Florida. 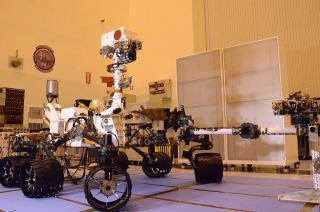 The next time the rover will be seen in this configuration is after it lands on the surface of Mars in August 2012. CAPE CANAVERAL, Fla. - NASA's next Mars rover, the car-size Mars Science Laboratory, or Curiosity, is almost ready to fly to the Red Planet. Beginning tomorrow (Aug. 13), technicians at the Kennedy Space Center in Florida will begin folding up the six-wheeled, nuclear-powered rover to pack it inside its heat shield. The rover, which at 10 feet (3 meters) long has been likened to the size of a Mini Cooper, was in its fully-deployed posture. The next time it will be in the same configuration will be after it is deposited on the surface of Mars in August 2012. "We're going to start buttoning up the hatches here," said Torsten Zorn, a robotics engineer with NASA's Jet Propulsion Laboratory in California. Over the next three or so days, Zorn and his fellow team members will work to fold down Curiosity's high-gain antenna, which will enable the rover to communicate directly with Earth. Technicians will also lock down the Remote Sensing Mast, which supports Curiosity's two stereo navigation cameras used for driving the rover and two science instruments to investigate the rover's surroundings. They will also fold up Curiosity's instrument-tipped arm, capable of reaching out more than 7 feet (2 meters) to collect and study samples of the Martian surface. Finally, technicians will tuck in Curiosity's six wheels, which are designed to roll the rover over obstacles up to 25 inches (65 centimeters) high and to travel distances up to 660 feet (200 meters) per day on the Martian terrain. "[We] just fold them up, like a little insect," Zorn said. Once all the folding, stowing and tucking is complete, the Curiosity rover will be ready to be mated with its descent stage vehicle and then fitted inside a tightly-packaged cruise stage and aeroshell that will protect the rover on its nine-month trip to Mars. That whole package will then be placed inside a protective shell called a fairing and eventually stacked atop the Atlas 5 rocket. In the days leading up to liftoff, engineers will install Curiosity's nuclear power source: a radioisotope thermoelectric generator, which produces electricity from the heat of plutonium-238's radioactive decay. This long-lived power supply will provide Curiosity with an operating lifespan on Mars' surface of at least a full Mars year (687 Earth days, or 1.9 Earth years). After arriving at Mars, the spacecraft will steer itself through Mars' atmosphere with a series of S-curve maneuvers similar to those used by astronauts piloting NASA's now-retired space shuttles. During the three minutes before touchdown, the spacecraft will slow its plunge to the ground with a parachute, then use retro rockets mounted around the rim of an upper stage to further slow its approach. Curiosity is about twice as long and five times as heavy as NASA's twin Mars Exploration Rovers, Spirit and Opportunity, which launched in 2003 and are still on the Martian surface. Curiosity inherited many design elements from its earlier, smaller cousins — including six-wheel drive, a "rocker-bogie" suspension system and cameras mounted on a mast to help the mission's team on Earth select exploration targets and driving routes. However, unlike Spirit and Opportunity, Curiosity has equipment to gather samples of rocks and soil, process them and distribute them to onboard test chambers that are inside analytical instruments. Those instruments include some of the most advanced scientific gear ever used on Mars' surface and a payload more than 10 times as massive as those of the earlier Mars rovers. Using these tools, Curiosity will investigate whether conditions on Mars may be favorable for microbial life today and for preserving clues in the rocks about possible past life. Robert Pearlman is a SPACE.com contributor and editor of collectSPACE.com. You can follow him @robertpearlman or on Facebook. Follow SPACE.com on Twitter @Spacedotcom and on Facebook.